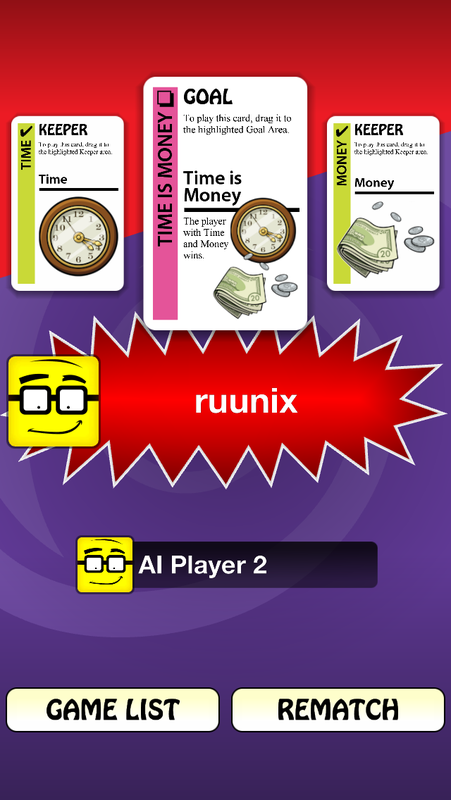 Being in the right place at the right time is a rare luxury in Fluxx. I grew up playing Uno as a child. It’s a fairly simple game, as card games go, and one that can be easily learned by almost any age group. If I were asked to explain Fluxx to someone whose only frame of reference was Uno, I’d ask that person to think about Uno with the training wheels off… heading straight over a cliff edge, when zero-gravity suddenly kicks in. 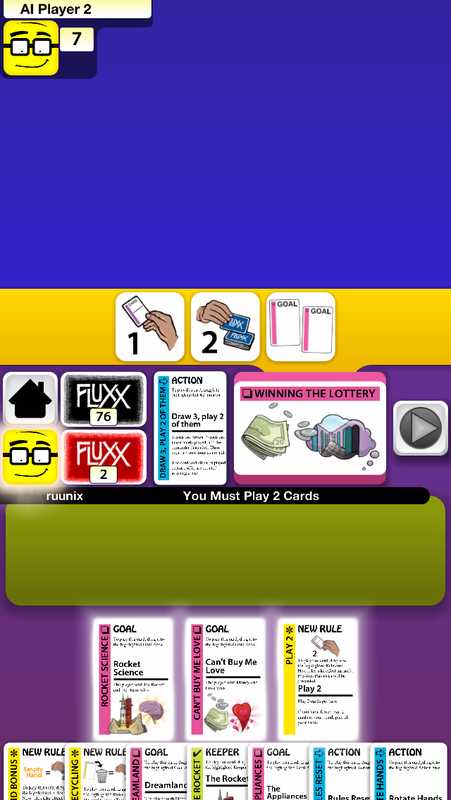 To play Fluxx is to not only tolerate chaos but to embrace it, and I say that with the highest level of admiration. Fluxx is a game with true mass-market appeal, a next-level Uno for those who’ve grown bored of the comparative simplicity. Rules were made to be broken, and in Fluxx, they will be broken and rewritten with nearly every turn. Instead of trying to shed all your cards to win as in Uno, you’re trying to collect a combination of two cards that happen to match the current criteria for victory. It’s trickier than it sounds, because simple possession of the winning pair is not enough; you’ve got to put them into play as well. Did I mention they’re likely to be stolen or otherwise removed from your hand? Or by the time of your next turn, the criteria for victory may have been completely altered. You and your opponents will be offered a dizzying array of options for changing virtually every element of the rulebook. Everything is temporary, victory and defeat are never assured beyond the scope of a single turn. It’s all the fun of tossing darts at a board while blindfolded and balancing on a randomly moving platform. I’d never played the physical version of the game, but at no point did I feel too lost to follow along with the action. The tutorial is quite effective at bringing the uninitiated up to speed. The AI opponent is available in easy (green) or hard (red) variants. Easy is clearly and wisely designed to help teach the game to new players. It will occasionally miss obvious opportunities to win. When given a choice of multiple targets for a given action, it will not always pick the highest-value target. So this isn’t Puzzle Quest, where newbies will be punished mercilessly for even the slightest rookie mistake. You’re given the luxury of realizing “ah, it could’ve won right there” and making sure you don’t fall asleep at the same wheel when your time comes. The hard AI is not nearly so forgiving, once you’re ready for a tougher challenge. The iPhone UI sometimes obscures a hand with lots of cards. This being my first foray into Playdek’s iOS fare, my lofty expectations were well met. The interface is top class, and nearly everything is intuitively obvious. The aesthetics are warm and pleasing in a fuzzy 1970s kind of way. When you’ve got quite a few cards in your hand on an iPhone, things can get a bit more cramped and difficult to read. At one point I was annoyed at how slowly the cards were being dealt, and of course there was an option to change that speed. Everything about this iOS implementation of the game leads me to marvel at how much more streamlined an experience it must be than playing with physical cards. Keeping track of the ever-changing rules from one moment to the next would be a big challenge in and of itself. Put it this way: I don’t think I’d be able to finish a physical game of Fluxx during my 25-minute train commute, but many of my evaluation games for the iOS version were completed during these same trips. While I did not have a chance to try the multiplayer options, the game offers local pass-and-play as well as asynchronous online. Besides the sometimes-cramped iPhone interface, there is another flaw worth mentioning: it never really feels like you’re developing a long-term strategy from game to game. Because the rules are so frequently randomized, you can only really strategize within the scope of your current game, and even then it’s more about wily adaptability than gritty determination. 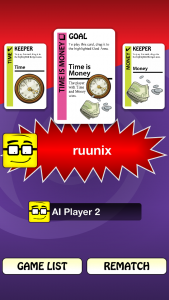 So there’s a bit of a “Groundhog Day” effect when playing Fluxx. You’ll gradually build up a portfolio of go-to tactical options based on what cards you have at any given time, but I imagine that’s about the extent of any sense of progression the game might hold for most folks. Once you’ve sufficiently familiarized yourself, luck is undoubtedly the biggest determinant of success or failure. If you’re in the mood for lighter, more accessible card-gaming fare, you could do far worse than Fluxx. Need a game suitable to play with older or younger opponents, or just those friends of yours who may not geek out quite as extensively? You’ve found it. Just don’t be surprised if you wind up getting hooked despite yourself. Embrace the chaos, and enjoy the ride.